From where I was standing to take this picture, I could smell exhaust fumes. The scene looks peaceful enough, but just before I pulled out my iPhone, about twenty pickup trucks and cars came by in an unbroken stream. This is the view from the house we’ve been considering. Not bad, eh? Except for the traffic! In Maryland we used to live on a country road with sixty mile per hour traffic going by, but there wasn’t much of it, and the house was set pretty far back from the highway—you got used to the occasional vehicle whistling by, and it wasn’t a big deal. 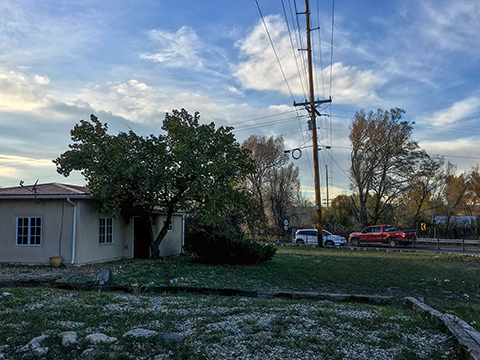 This place, the Taos house in question, is situated precisely at the junction of three local roads at a three-way stop. That means there’s traffic on two sides of the yard and plenty of it, also that two out of three vehicles that go by are accelerating hard. The speed limit is thirty, most drivers go forty plus. There’s nowhere to pass and tailgating is the rule. What’s happened in Taos is that certain roads existed at one time, housing was allowed to grow all over (taking advantage of those existing roads), and now there’s no room to build new ones. Even if there were, that’s not how things are done around here. It’s basically too late, anyway, and there’s no point in assigning blame. The result, however, is more and more traffic squeezed onto the same old narrow two-lane roads with no shoulders. Most of them, if paved, are curbless wonders with asphalt roughly laid on top of something awful. Dangerous for drivers, impossible for bikers, no room for walkers. It’s difficult to describe the tension of simply going from point A to point B in such a road system. We’ve been back to the property twice since seeing the inside. The photo above is from Friday evening. On Saturday morning we visited again and walked around while I inspected the fence. This time my wife was paying attention to the traffic noise. “It isn’t going to work, John,” she said. I knew that, of course. The best place we’ve seen yet is literally under assault from all the traffic. You wouldn’t want to sit outside despite the view, there are no birds, and at night the headlight beams would sweep across the walls. This one hurt real bad because the house itself was perfect. We were going to go grocery shopping afterwards but couldn’t face it. The whole day turned essentially dysfunctional as I collapsed and took on all imagined blame. UPDATE: Here’s another view. The road is even closer on the other side of the house. Two of four sides, in other words. Vehicles moving to the right are accelerating from stop signs—more noise than simply cruising by. “T” intersection not visible here, but just off camera to the left. This is the primary road residents on the heavily built-up west side use to reach north-south highway for local business (Walmart, banks, MVD, Ranchos P.O., hospital, doctors, dentists, motels, restaurants, supermarkets, drug stores, hardware stores, movies), or to head south for Santa Fe and Albuquerque. Almost constant traffic. Oh, dear John, it does indeed sound impossible. Kathy is right. I know. It’s sat there for over a year for a reason. Keep looking! Kathy would go crazy in Jemez springs. Sometimes people will take less for homes to get out from under them especially if they own two houses. Some in Taos have been sitting along time. Dont be afraid to do low offers. We bought a house from a bank one time for a third less than it was worth because banks don’t want to own them just sitting there. Hang in there! “Some in Taos have been sitting a long time.” So have I. It makes you wonder! But we’ll keep at it. I never been to Jerez Springs. I googled and saw that place. It looks like a ideal man cave (garage) and it even has a nice log cabin too. Well, it’s in the mountains, and you’d probably like that! Let’s put it this way: no one’s in a rush to move there, but as a destination for a day trip, it’s okay. I’m glad you caught those clouds. I saw them but couldn’t stop. I was taking my stepson to work the back way and like you say, there is no shoulder to pull off on and too much traffic. Plant trees, build a fence for the headlights. You really don’t want to move. Hah! Yeah, checked that out. There are some things you could do, if only there were just one busy country road instead of three of them. There’s also a pack of excitable pit bulls behind the neighbor’s fence, and one of them was loose. It’s a trap. 🙂 A distraction. the pit bulls would be the problem. Any house and property can be made private. Dogs, no. Well, sure. You could make it a different kind of place. I’d sacrifice a lot for that view alone, without even adding in how nice the house sounds. But living in the city makes me immune to traffic because I live with it all the time, and I don’t even smell exhaust so I must have gotten used to it through the years. The air is the best thing in these parts. Can’t go backwards. It is a great view, though! Hmmm, with that new photo I can definitely see why the traffic would be a problem for you…it’s practically driving through the yard. In fact, if the road is that busy I’d be afraid that one day I’d wake up to find a Honda parked in the house…but maybe thick adobe walls might hold up against even that. I wouldn’t want to find out the hard way! With the windows closed, the noise does go away. That’s true of most adobe construction. Even in our old rented one, we rarely hear a thing outside.